The mobile computing market has a new power supply offering that will surely change the way you design your next DC-powered PC, the M3-ATX. The folks at mini-box have engineered an all new power supply borrowing technology from their successful M1-ATX and M2-ATX intelligent automotive power supplies and their ultra small picoPSU DC converter boards. The M3-ATX is the world’s smallest ATX compliant power supply, providing 125 watts with an input voltage of 6 to 24V. This range is ideal for any battery-powered application, whether it is in an automobile, factory floor, robot, or a remote location with solar power. At 125 watts, you’ll have ample power for your ultra low power VIA EPIA boards, and it can even power boards using Intel’s highly capable Core 2 Duo chips. Did I mention it’s the smallest ATX supply out there?! At 38 mm x 45 mm x 25 mm (w x h x d), the M3-ATX plugs directly in to your ATX connector on almost any board, off-loading any additional footprint that a traditional power supply would take up. That means your PSU is on your board, not next to it. 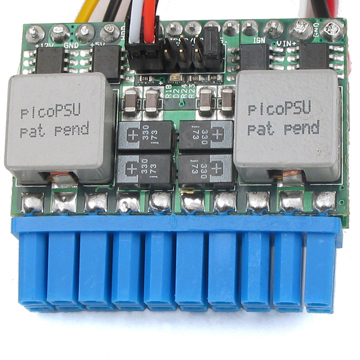 Combine a Mini-ITX board with a super reliable IDE flash module for your storage device and this PSU and you get a system with a footprint of 17 cm x 17 cm. That’s not too bad if you’re crunched for space. And there is no need to worry about additional heat in the confines of your small machine; this guy runs fanless. Yes, quiet and cool. The M3-ATX really shines in automotive scenarios where you need your machine to continue to run even after you’ve killed the ignition. Think police cruiser, dump truck, or daily commuter running in for a coffee. Who wants to give that PC a hard shut down when you turn off the vehicle and then have to wait for it to boot back up when you restart your car or truck? This PSU is equipped with the intelligence to sense the ignition signal and will tell the PC to continue to pull from the battery even if the vehicle has been turned off. But don’t worry about it draining your battery. The M3-ATX has the smarts to know when the voltage levels are getting too low and it will cut off the 5V standby signal, so you don’t run the risk of not turning over the engine when you need it. Additionally, it will provide stable power to your PC during engine cranks where you’ll find the battery voltages fluctuating below the 12V mark. The M3-ATX is truly an innovative product that opens the doors to a huge PC hardware selection for your battery-powered computing needs. Give us a call at 802.861.2300 x1 and we’ll assist you in configuring your next project’s hardware set.